At Discover Himachal Tours & Treks, we are organizing amazing trekking tours for the tourists. Trekking is an adventurous activity that includes walking on a hill or anywhere away from the city for several days without stopping for a long time in between. 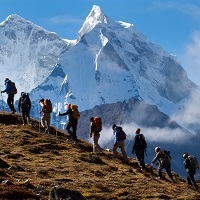 Tourists can avail our services to go on an amazing trek with their friends or loved ones. Has camping been on the top of your to-do once in a lifetime list? If yes, then you should definitely avail services from Discover Himachal Tours & Treks for having an adventurous camping activity with your friends. A tent and other essentials are arranged along with an apt place for a camping activity. So, enjoy sleeping amidst the sounds of animals and birds by getting a camping trip organized from us. 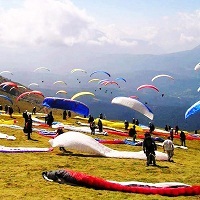 As a recreational activity, paragliding has been at the top for adventure enthusiasts. At Discover Himachal Tours & Treks, we are providing services for organizing thrilling paragliding tours for the tourists. A lightweight glider aircraft or paraglide is provided to the adventurer. The pilot has to be seated in the harness. Avail our services to enjoy your paragliding adventure! Hang gliding is an air sport activity that is also known as deltaplane activity. The pilot has to fly a foot-launched aircraft. Since the aircraft does not work with a motor, the adventure is more in hang gliding. So, avail services from Discover Himachal Tours & Treks for getting a thrilling hang gliding adventure with your friends. 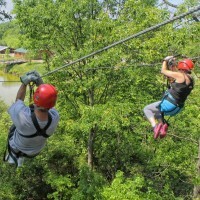 Zip lining is a recreational activity undertaken with family members or friends. A pulley is suspended on a stainless steel cable that is escalated on a hill. The activity should be undertaken under the supervision of the trained professionals. Thus, contact Discover Himachal Tours & Treks for getting amazing zip lining adventure with your loved ones. For the bikers out there, the activity of mountain biking is appropriate. The bikers ride the bicycle off-road in this activity. However, they make use of high-tech bicycles that give high performance and durability while riding on a rough terrain. At Discover Himachal Tours & Treks, we provide exceptional services for giving you an amazing mountain biking experience! Jeep safari is one of the best activities to be conducted with your closed friends. You get to see different types of animals walking besides your jeep. It is a thrilling experience! At Discover Himachal Tours & Treks, we are organizing amazing jeep safaris for the tourists. We provide a spacious jeep to the tourists for giving them an excellent safari. Mountaineering is a recreational activity that includes mountain climbing. It is similar to trekking; however, you need to take a backpack along with it for more adventure. Mountaineering may also include sport climbing, bouldering, or indoor climbing. Tourists can avail services from Discover Himachal Tours & Treks for an amazing mountaineering adventure. 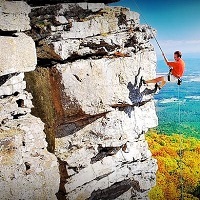 If you are looking for an exhilarating activity with your friends, then opt for rock climbing. Along with all the thrill of climbing different sizes of rocks, this activity will make you an amazing climber. At Discover Himachal Tours & Treks, we are engaged in organizing awesome climbing activities for the tourists as per their requirements.